As building codes continue to become more complex in their requirements for protection against moisture damage and unwanted air movement, applicators need systems that are quick and easy to install while still providing excellent performance over the lifetime of the building. 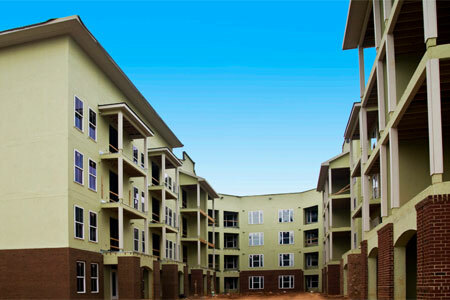 StoGuard is a water-based air and moisture barrier system ideal for all types of construction. A fluid-applied system, StoGuard forms a fully-adhered seamless monolithic air and moisture barrier on the exterior wall, protecting against moisture intrusion and unwanted air movement. StoGuard liquid membranes can be applied either by roller or airless spray increasing the speed of application on the wall while simplifying integration with other wall assembly components. StoGuard systems include a variety of interchangeable components that allow for continued production on the wall regardless of complex design features or site conditions. StoGuard™ offers a simpler way to meet today’s demands. Simplified installation provides superior protection against moisture intrusion and air leakage. Common building wrap systems rely on lapping, taping, and cutting of materials to create a moisture barrier. Even when properly applied, these systems are prone to tearing and loss of adhesion which can lead to costly callbacks or even long term system failure. StoGuard systems are fully adhered to the substrate, creating a seamless, monolithic barrier that can be installed in a fraction of the time necessary to properly install a building wrap. StoGuard systems include a variety of interchangeable components that allow for the perfect combination of speed and ease of installation along with long term performance. StoGuard components are designed to increase productivity on the wall without costly slow downs or delays, even in cold and wet weather conditions. Sto EmeraldCoat can be left exposed to weather for up to 6 months. Since introducing the world’s most energy efficient and easy-to-apply insulation and finishing system in 1963, Sto has been dedicated to consistently setting new industry benchmarks around the needs of each and every customer. As a building owner, you need to keep your property value high and your costs low. As an architect or specifier, you need to focus on aesthetics and feasibility. As a contractor, you need products that are easy to work with. Whatever your role, Sto understands your unique needs, and delivers the smart, innovative materials and solutions that make your job easier. That’s what makes us an innovative leader in integrated exterior wall systems. But we don’t stop there.